Why Choose Our Window Washing? Enjoy of a reliable service in Docklands that has received over 95% of positive client feedback! Q: What does the window cleaning in Docklands involve? 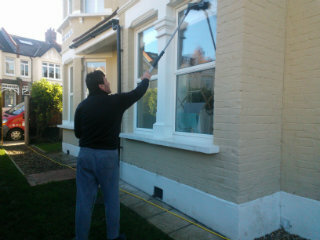 A: Our service will be carried out by experienced and police-checked Docklands window cleaners. They'll also wear branded uniforms, so you'll easily identify them as soon as they approach your property. A: In essence, this is a lengthy pole that shoots water under powerful water pressure. It allows the cleaners to reach the fourth floor of any commercial or domestic building without lifting their feet off the ground. A: Not at all! The experts will utilize a special de-mineralised water tank inside their van. However, if the tank is empty, we will readily accept your offer. A: You must make sure that there will be a empty parking space within 30 metres from your domain and on the same side of your windows. The technicians also need to have an effortless access to your property. When you hire a window cleaning Docklands session, you'll be able to renew the casements of any premises at fair rates that remain unaffected by minimum contracts or undisclosed payments. See if you agree with our point of view – stop by our handy price table below. Irrespective of where your stains have taken refuge, our efficient window cleaning in Docklands will fight them off with ease. We have included various washing methods. Our outside window wipe is designed for buildings that do not exceed four storeys. To let the sunlight back inside, the window cleaners in Docklands will arrive in a van, supplied with an extendible water-fed rod. This gear is connected to a water tank, filled with distilled water. After being released as a powerful flow from the pole's brush-head attachment, the fluid will dissolve all blemishes in an attempt to renew its previous structure. To reach dusty window corners of multistorey properties, we'll send a seasoned team for rope access window washing. These approved climbers will use regularly checked ropes and harnesses or deploy ladders and cherry pickers to renew the glamour of your panes. We've got all necessary COSHH records in place and follow each safety requirement. To make the interior facet of your window façade just as glossy, the technicians will depend on the usual ladder and squeegee cleaning procedure. Over time, we've answered the cleaning calls of customers from many neighbouring regions. As a direct result, we expanded window cleaning Docklands's horizon and you can now witness our cleaning vans in the districts below. Alternatively, get a free instant quote or order affordable window cleaning services Docklands SE16 online, through our web site.